Remember Lyons Maid ice lollies? The Orange Maid, a belter of orange cordial flavoured ice, lasted ages, always good value. The Cider Quench which made us giggle and pretend to be drunk. The Zoom, the Fab and of course the Cornish Strawberry Mivvi. Treats from childhood years along with those brick like blocks of ice cream the perfect shape to slice and put between oblong wafers or into those funny rectangular cones (is that a geometric impossibility?). 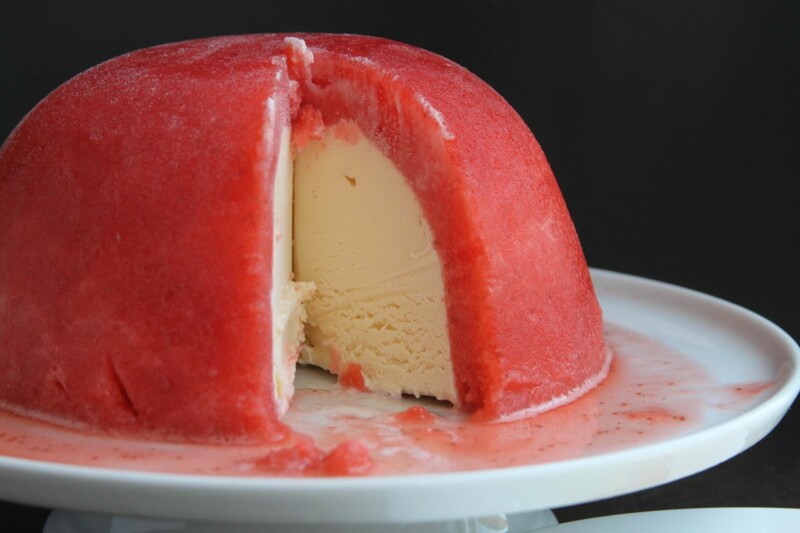 The Strawberry Mivvi in particular required a certain skill to pick off the strawberry ice outer shell leaving a heart of vanilla ice cream to be licked quickly before it melted. I liked the strawberry layer and I liked the ice cream but it was the combination of the two that makes the Mivvi excel, that British classic Strawberries and Cream – on a stick. Not content to leave this alone I decided a giant version was required, a Mivvi bombe surprise, a family size spectacular, a Mighty Mivvi if you will. This strawberry sorbet is one I’ve made many times over the years, the pure fragrance of the berries sings and you can easily dispense with the rest of this recipe and eat it as it is. I sometimes make vanilla ice cream but on this occasion have used 2 tubs of a good store bought one. You need to make this a day or so before you want to eat which of course is only a bonus as it sits happily in the freezer until you are ready. Before you start however, make sure you have a good amount of free space on a freezer shelf, I didn’t take this early precaution and had to do a ridiculous amount of moving and rearranging to accommodate the bowl. Learn from my mistakes! Dissolve the sugar in a little of the 500ml of water over a low heat then cool. Whizz the strawberries with the lemon juice and then mix with the sugar syrup and remaining water. Sieve and then freeze in an ice cream maker or put in a tub in the freezer and mix regularly to break down the ice crystals. Once you have sorbet by either route transfer it to a 2 litre bowl, then take a 1 litre bowl with a layer of cling film on the outside and push it gently into the larger bowl thus squishing the sorbet up the sides – this sounds more complicated than it is. Put in the freezer for a couple of hours to firm up. Half an hour before the time is up take your 2 tubs of vanilla ice cream out of the freezer to soften. 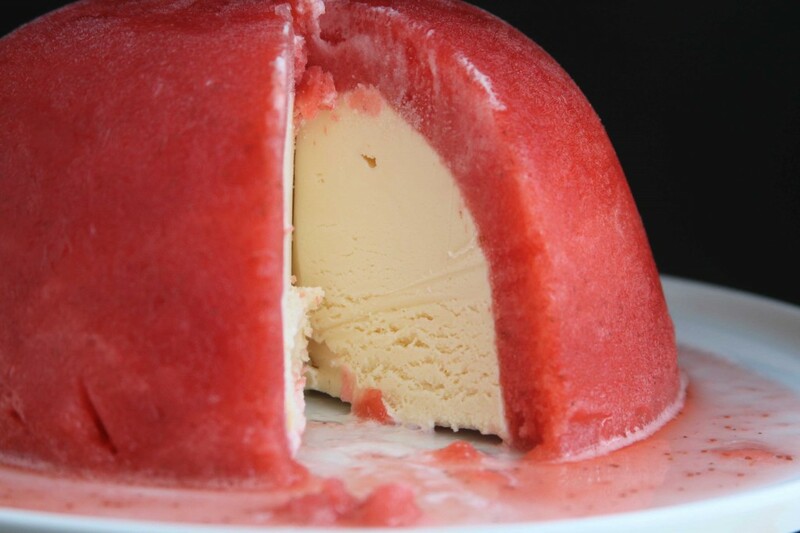 Then remove the smaller bowl, and the cling film from the sorbet (you may need to put a little warm water inside the smaller bowl to encourage its release) and then fill up the cavity with the vanilla ice cream, easily done it its softened state. Put it back into the freezer for at least an hour to firm up until you want it. Then (conversely) you will need to leave the whole thing out of the freezer for 15-20 minutes before you want to cut it, this too may need sitting in warm water to encourage it to part company with the bowl. Serves 8, with aplomb.